MDMK general secretary Vaiko and New York-based Human Rights Watch made separate calls to assist 19 Tamils being readied to be deported to Colombo from the United Arab Emirates. In a telephonic conversation, Vaiko reminded Manmohan Singh of his letter a few days ago on the issue of 19 Sri Lankans who were earlier given asylum by the UAE government but were now poised to be deported to Colombo. 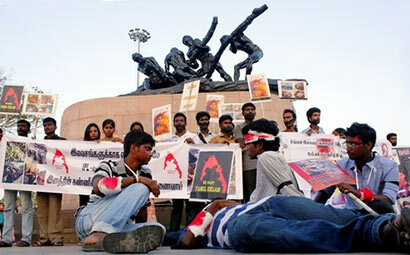 India should intervene in the matter and ensure that they are not sent to Sri Lanka, he urged. A Colombo report said Human Rights Watch (HRW) has appealed to the UAE not to deport 19 Tamils who have been recognised as “refugees” by the UN High Commissioner for Refugees (UNHCR). The refugees have been told by the UAE authorities that they must leave the country by April 11. If the recognised Tamil refugees are returned to face torture in Sri Lanka, it would signal a total disregard for their well-being and the most basic principle of international refugee and human rights law, Bill Frelick, Program Director at HRW, said on Saturday. “Sri Lanka’s treatment of Tamils they deem politically suspect is dismal and under no circumstances should the UAE deport this group there,” the HRW’s website quoted Frelick as saying. The 19 refugees, including six women, a 66-year-old lady and a four-year- old girl, were part of a group of 46 Lankan Tamil asylum seekers who fled Lanka by boat in October 2012, hoping to land in Australia. After their boat ran into trouble, they were rescued by a Singaporean ship on October 14 and taken to Jebel Ali, south of Dubai, in the UAE. In November, UNHCR recognised 39 of the 46 as refugees. But the UNHCR has not been able to secure third-country resettlement for 19 of them. Ahh..Core of the matter …all the drama.. one of the key purpose of all allegations and demonstrations and etc. etc. – fear of losing REFUGEE STATUS (the funding.. Cushy life style and benefits etc. etc. )- Invariably Viko who’s a permanent employee of the LTTE will raise issues.. who is surprised? It is strange that the Singapore vessel took the refugees be taken to a destination designated by the UNHRC. Since the uNHR has designated them as refugees they they could negotiate with nations that subscribe to the UNHR to accomodate them rather than create an issue similar to the St Louis in 1939. Fortunately things are not as bad as it was in 1939.